The Ornamental Tile quilt block is a little more challenging than some blocks -- only because of the layout of the individual pieces that make the four pieced units in the block. They are not difficult to construct, but care must be taken for accurate quarter inch seam allowances so that the pieces do not become distorted. 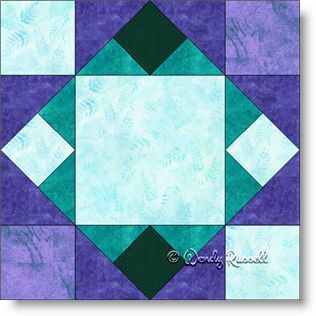 Once the pieced patches are created, the rest of the construction of this uneven nine patch quilt block is a breeze. The next step is playing around with quilt layouts to find what pleases you. The sample quilts illustrated give you just two of the many designs that could be made with this quilt block.